✨ $ off product collection - A $ off discount that will apply to all products within a product collection. 3. Reward Title: Give your reward a title that lets your members know which product collection is discounted and gets them excited to redeem it. 8. Tick the collections that the reward refers to. 📝 Note: You can select multiple categories for the reward to apply to. How do members redeem $ off product collection rewards? 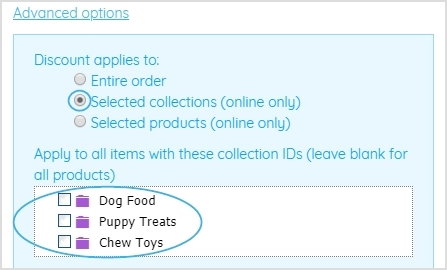 Online - The member adds the relevant products specified in the reward to their cart and their unique coupon code to the discounts bar at checkout. The reward discount is automatically applied to deduct the discount off the relevant products. If they do not add the relevant products to their cart, the reward will not work. In-Store - 📝 Note: This reward type is recommended to be online only. Even if a member has enough points to redeem multiple rewards, they can only use one reward discount code at checkout at a time.